Artist rendering of the X-59 Quiet Supersonic Technology aircraft. 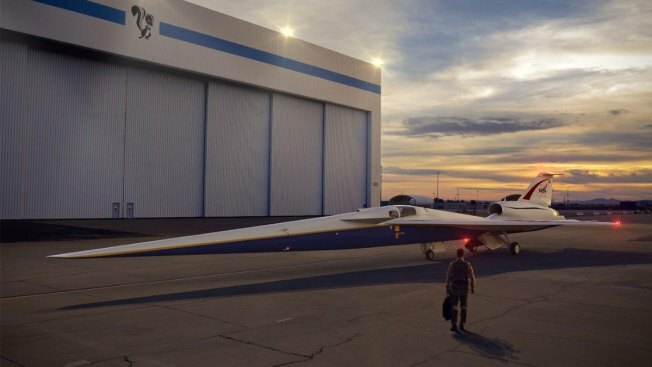 Lockheed Martin's experimental supersonic plane has officially entered production, the defense giant announced Friday. Earlier this year, NASA awarded Lockheed a contract worth nearly $250 million to develop an aircraft capable of reaching supersonic speed without creating the deafening sonic boom that comes with breaking the sound barrier. Lockheed answered with its X-59 Quiet Supersonic Technology aircraft, which is designed to cruise at 55,000 feet and reach speeds of about 940 miles per hour. The new aircraft is expected to create a noise level akin to the sound of a car door closing. Current regulations ban commercial supersonic aircraft from operating over land. New companies like Boom Supersonic are trying to make use of the technology for transoceanic routes, with backing from investors like Richard Branson and Japan Airlines. But Lockheed Martin and NASA want to advance the technology through noise reduction to overturn regulations. The new experimental plane is designed to return supersonic passenger air travel to routes over land. The last such flight was by the Concorde in October 2003. "The start of manufacturing on the project marks a great leap forward for the X-59 and the future of quiet supersonic commercial travel," said Peter Iosifidis, Low Boom Flight Demonstrator program manager for Lockheed Martin Skunk Works. "The long, slender design of the aircraft is the key to achieving a low sonic boom. As we enter into the manufacturing phase, the aircraft structure begins to take shape, bringing us one step closer to enabling supersonic travel for passengers around the world," he added. The X-59 will conduct its first flight in 2021. It will be used to collect community response data on the acceptability of the quiet sonic boom generated by the aircraft, helping NASA establish an acceptable commercial supersonic noise standard to overturn current regulations banning supersonic travel over land. This new contract is a separate venture from Lockheed Martin's work with Aerion Corp. to develop a supersonic business jet, the AS2, which has its first flight planned for 2023. Lockheed Martin is also in the process of developing the SR-72, a hypersonic unmanned plane dubbed the "son of the Blackbird." And when it comes to developing a high-speed reconnaissance aircraft, the Pentagon's top weapons supplier is playing in its home court. In 1976, the Air Force flew Lockheed Martin's SR-71 Blackbird from New York to London in less than two hours — at speeds exceeding Mach 3, or three times the speed of sound. The SR-72 is envisioned to operate at speeds up to Mach 6. And while the hypersonic SR-72 isn't expected to be operational until 2030, the company sees developing a platform of that magnitude as a game changer. "This could forever change our ability to deter and respond to conflict, allowing warfighters to quickly address threats before an adversary may have time to react," Lockheed Martin CEO Marillyn Hewson said of the hypersonic plane in March. Hewson also said the development of the aircraft, which is estimated to cost $1 billion, will change the "definition of air power by giving the U.S. significant tactical and strategic advantages."